Technology is great, but in a field that is so accustomed to striking tenuous balances, it can be just the thing that tips the scales in one direction. Electric stun guns have been around since 1974, but for the slow-moving legal field, it’s a recent advance. In a few current cases, courts have been trying to weigh the effects of this new technology into the question of what amounts to excessive force by police. The threat of police brutality is not new, and in fact, protections against it are contained within the bill of rights. In the Fourth Amendment, the provision prohibiting unreasonable search and seizure is read to limit the amount of force police can use in a given situation. Courts have reasoned that physical force, since it deprives you of your right to simply go on your way peaceably, is a type of seizure. But the Fourth Amendment doesn’t prohibit seizures, only unreasonable seizures. The touchstone has therefore become whether a specific form of police conduct is reasonable for the circumstances. There are two primary situations in which courts have ruled police force is justifiable. First, when there is a direct threat posed to the officers. The second is more controversial – when force is used against someone who is obstructing official police duties. Since this second facet is very vague, there have been disagreements over what specific duties an officer can use force to carry out, as well as what level of force they can use. For example, only reasonable and necessary force is authorized when police are making a lawful arrest. Deadly force is almost never justified for police to fulfill their duties, only to defend themselves. Volumes have been written about the intricacies of each category. But it’s safe to say that stunning a pregnant woman three times in front of a school for speeding is going to lead to questions. Even after the woman made plain that she was pregnant, three Seattle police officers resorted to tasers when she refused to sign for a ticket. Aside from the question of whether the amount of force was reasonable, another conflict in this case is that the officers seemed to be trying to make an arrest, but a traffic violation is not something for which an arrest is authorized. Police are only allowed to use reasonable force when they are performing a sanctioned duty. Their duties were to issue the ticket, and judges have argued that the woman’s refusal to sign did not interfere with that duty. But this isn’t the first time police have used tasers against those who posed no apparent threat. Last year, a patrol camera caught an officer stunning a 78 year old woman who reacted adversely to the experience with being pulled over. This was another instance of a motorist refusing to sign for a traffic ticket. Harrowing especially when you consider there are several instances of cardiac arrest in elderly persons who are shocked by police. The issue may stem somewhat from misconceptions on the part of police about how much force is inherent with the use of a taser. The manufacturer insisted that, although it is certainly painful, the use of its stun guns was completely safe. 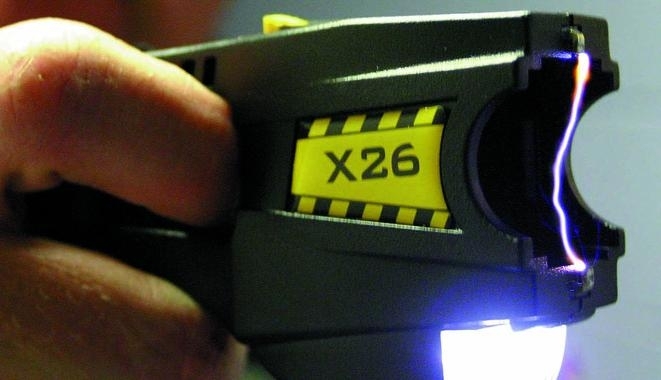 However, a recent study by two cardiologists at the University of California San Francisco found that in-custody deaths increased by a factor of six after California police departments began using tasers. By comparison, deaths from handguns increased by less than one third of that amount over the same period of time studied. It has been theorized that the electric shock delivered by the devices can interfere with the heart’s natural pulse. This has led to the manufacturer advising police to avoid aiming the tasers at the chest. After these facts and counter-arguments became more fully known, the Federal Appeals Court for District 9 issued ruling that restricts police use of tasers somewhat. It ruled that police could no longer use the devices in instances that they were obstructed in their duties or encountered resistance, but only in cases where the person poses danger to the officers. Some question the incongruity of police responding to lethal threats with non-lethal weapons, but other courts have followed the 9th district’s lead. A Texas court recently ruled that tasers are only permissible where there is a threat to a person’s life. At the very least, these rulings indicate that there will be better training and clearer procedures for when these devices can be used. It took courts a while, like it always does, but gone are the days where officials believe tasers are virtually harmless. For those who are injured by excessive police force, there are many avenues of recourse. They may sue the government for a breach of civil rights, and they may also press the state to pay for any medical bills incurred. In rare cases that a person’s permanent medical condition is impaired, damages for the loss can be obtained in court. Aside from suing the government, specific facts may also allow one harmed by police misconduct to sue the manufacturer of the equipment used. These companies are under an obligation to fully inform police of the proper way to use the devices, as well as inform departments of the risks. Can the Police Shoot Your Dog For Barking? The use of a stun gun or taser gun will definitely depend upon the attending circumstances. If a policeman is threatened with his life or limb, he must use such reasonable force to repel such danger. This will definitely apply to everyone even if not a police officer. Now, the real question is how will that force be used. In some situations provided in the above article, like stunning a pregnant woman for not signing a ticket, then the court ruled very correctly that it said issuing tickets does not imply force if not signed. The scenario will depend upon a certain situation. What should policemen or even citizens when using that stun gun or taser gun is to weigh the situation whether or not extra force will be needed in case an unexpected thing will happen. “the court ruled very correctly that it said issuing tickets does not imply force if not signed” — you have your facts wrong. the court rules that the use of force was justified and the officers are immune. there was a huge majority outrage against this judge’s ruling, and i hope the court grants them the second hearing they request, hopefully with a judge that isn’t a crazy lunatic this time.